Pressure is being mounted on the Finance Ministry to approve the renewal of a lucrative IT contract provided at Mater Dei Hospital by a company owned by the husband of Health Minister Chris Fearne’s chief of staff, Finance Ministry, sources told Times of Malta. Health Minister Chris Fearne with Carmen Sammut. The sources said that as a contract connected to the maintenance of the Patient Administration System – known as CPAS – is coming to an end in a few months’ time, pressure is being mounted on the Finance Ministry to approve a direct order contract to Cursor Ltd to continue with the job without the need for a new tender. “They (the Health Ministry) want us to issue the CPAS contract renewal through a direct order to the same company supplying the system since 2013. This is not on and we are resisting it as technology changes and other operators should be given a chance. However, pressure is increasing week-in-week-out and it will soon reach our minister,” a senior official said on condition of anonymity. Asked to state when the current contract with Cursor Ltd will expire, how much has the company been paid so far and whether a new public tender will be issued, a spokeswoman for the Health Ministry at first refused to give any information citing “commercial and confidential” reasons. However, when Times of Malta insisted there was nothing commercial in stating when the current contract will elapse, the spokeswoman said this will expire in November. However, she did not reply on whether a new public call, according to government procurement rules, will be made. Owned by Mark Sammut, a former collaborator of disgraced Nationalist Party finance minister John Dalli, Cursor Ltd has been the recipient of a number of government tenders and direct orders in the past years despite that its owner was also a senior Transport Malta official when the authority was headed by former Labour CEO James Piscopo. His contract was terminated as soon as Transport Minister Ian Borg took over. 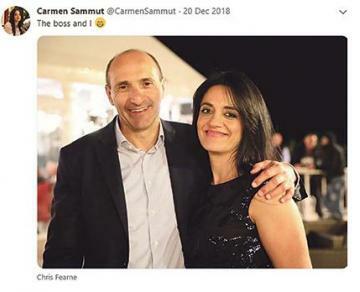 Mr Sammut’s wife, Carmen, the owner of Mall Systems Ltd – another IT company registered at the same offices as Cursor Ltd and the recipient of a number of other government jobs – was recently recruited by Health Minister Chris Fearne as his ministry’s chief of staff. Despite industry sources claiming clear conflicts of interest in Ms Sammut’s new role and her connections to the IT companies providing services to the government, including the Health Ministry, Mr Fearne defended his choice stating his chief of staff was not directly involved in the IT business. Mr Fearne is considered to have embarked on an unofficial campaign trail to replace Prime Minister Joseph Muscat as Labour leader when he steps down. Sources insist that Ms Sammut, hailing from his constituency, is exclusively working on his bid.